Some generative, collective thoughts for transparency and against competition. Thinking about all the things that are supposed to go unspoken in the art world, and artists’ self-preservation, and how even a teeny bit of transparency can seem risky or radical in the obfuscating art world. Our battles seem so hard won, why share any insight with others? Exactly because none of this is easy. Info and access are the easy bits, relative to good work, persistence, and longevity. 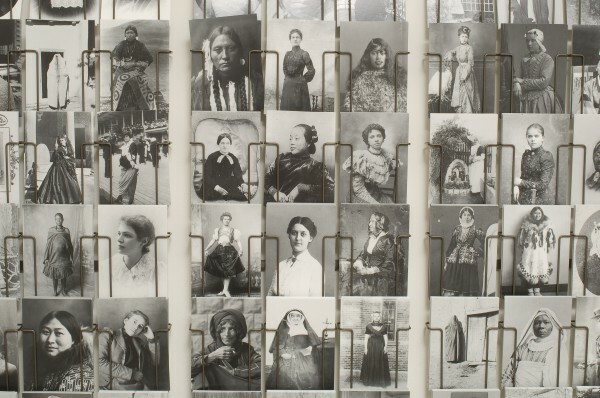 This is an interesting premise for a show: postcard reproductions of early Daguerreotypes of unidentified women, with texts about recognized women, given away for free. Increasing the visibility of women through this act of generosity/ distribution. More info at the artist’s site. It’s on view at Jack Hanley Gallery in NYC. Nice to see non-commercial projects at a commercial gallery. Few things impress me as much as discovering that champions are also genuinely nice people. In Born to Run, Christopher McDougall wrote about Scott Jurek’s constant encouragement of fellow runners. After setting records at 100-mile ultramarathons, Jurek would plop down in a sleeping bag and cheer on every last runner, sometimes for 12 hours or more. During a 50-mile race in sizzling Mexican canyons, as he pursued the lead runners, Jurek stopped to brief a fellow runner on the trail conditions and aid stations ahead of her. He increased the distance he’d have to reel in his competitors so he could help a friend. I’ve had the pleasure of learning from one of the nicest and toughest people I know. Bunkerd Faphimi is a muay thai figher and trainer at Fight and Fitness in San Francisco. He has an astounding 350+ fights under his belt. He’s known in Thailand as the People’s Champion, and as soon as you meet him, you’ll know why. He’s incredibly kind, generous, and playful. Have a look at his fight videos. He likes to take a lot of punishment, and yet, he’s often smiling in the ring. Not a showboating smile, but one of enjoyment. Better yet, watch him spar with students. He offers a near-constant onomatopoeic commentary, delighting in an activity in which he’s mostly letting himself get kicked, punched, and put in the clinch. He’s the living antithesis of both the evil Karate Kid Freudian-father archetype sensei, and, with his sheer unpretentiousness and demystified approach to muay thai, of the ‘magical Asian’ Mr. Miyagi. His love of muay thai, and of life, is like exuberance embodied. This gratitude for life experiences also extends to gratitude to other competitors. Though fighters and promoters hype fights as ways to settle personal beefs, fighters also experience profound gratitude and respect for competitors when the fight is fair, their skills are closely matched, and the fight is so enjoyable that the outcome becomes less significant. When you’ve witnessed your opponent’s skill and heart firsthand—when they’ve gained your respect and you haven’t compromised yourself or your performance in any way—you recognize that there is no shame or sadness in losing to such a worthy competitor. This is very similar to psychologist Mihaly Csikszentmihalyi’s definition of flow: the activity becomes autotelic, skills are well-suited to the challenges, and participants lose themselves to the activity. You can see this elatedness exemplified at the end of bloody battles when the fighters, after the last bell, happy and exhausted, embrace. They also often gently touch each other’s heads or draw their foreheads together—I’ve even seen a boxer wipe another’s face. You don’t have to be a social psychologists to recognize these signs of affection and intimacy. Their wide smiles are pictures of gratitude. (Forrest Griffin vs. Stephen Bonnar, TUF1, is a classic example. I’m sure I was not the only fan rooting for both of them by the end.) Sometimes, one fighter will raise the competitor’s hand in the air, not necessarily to signal his own loss, but to acknowledge his opponent’s champion spirit. In a world of machismo, humility shines. Premise #1: True champions express gratitude, humility, and generosity. McDougall writes that people are born to run, and that we love running because we love being with other runners. We are part of a human pack when we run together. Though endurance running is often accompanied by pain and exhaustion, many top runners compete with smiles on their faces. The joy of the activity is self-evident; the urge to help others enjoy the activity follows. Speculations: Art is highly competitive and individual artists often compete against each other for grants, residencies, commissions, exhibition opportunities, and teaching jobs. Who are the top practitioners in the arts who express profound generosity and gratitude? How do artists—even as competitors—help each other? Share our joy? Express our pack-hood? When do we help each other find the flow? Is art practice like endurance running? Can artists find the joy even as we slog it out for miles in the rain alone, as well as when we assemble and compete? When our skills are evenly matched how do we raise another’s fist in the air, recognizing their spirits? Is there a lesson for artists to be learned about becoming a contender before becoming a champion? Read the abstract of a fantastic profile of Bunkerd by Elif Batuman in the New Yorker. Watch a video interview with Bunkerd on MyMuayThai.com, an excellent resource for all things muay thai by a true practitioner. [Added October 16, 2011] Read a recent blog post by Jurek on running with others. … the idea is that the unexpected nature of the gifts will leave the customer not just pleased but also grateful. Gratitude is a powerful, and potentially quite profitable, emotion to inspire. Perceived unfairness can throw reciprocity instincts into reverse: instead of being disproportionately grateful, you might feel disproportionately spiteful — and take your business, and your loyalty, elsewhere. I’m all for gratitude, when it makes people happier. In this case, it seems like customers are being subtly manipulated to feel a little more satisfied with their hotel experience, while its investors and evil marketing geniuses might become a lot happier with their bottom lines. Is a kinder, gentler capitalism better than a cutthroat one? Ideologically, no. Pragmatically, though, empowering workers to reward pleasant customers seems, well, nice. Service sector workers might like having some agency in the workplace. And what does this tell us about relational aesthetics, which is still somewhat marginalized as a practice (as an emergent field, its validity is often up for debate), when corporations are talking about reciprocity and relationships? Things are grim, but I can’t stop thinking about happiness. Positive psychology — a relatively new field of evidence-based self-help for being happier. Think of it like the shift in medicine from treating illness to increasing wellness. As Tal Ben-Shahar, PhD, writes in Happier, pretty much everything we want in life ultimately leads back to happiness. The idea is to increase happiness in daily life, rather than dealing with unhappiness only during moments of crisis. Practicing gratitude is one of the oft-cited methods of increasing happiness. I’m tremendously grateful for friends helping friends. I know, I know, everyone’s hurting now financially. But a lot of artists are freelancers, and while freelancing is typically like riding a roller coaster, it seems like a lot of my peers are feeling lost in a free fall. These are bright, hardworking people doing everything from graphic design, to interactive art direction, to preparator/installation to cooking. The financial safety nets are being strained, but it seems like social bonds are staying strong… Artists helping artists. Freelancers helping freelancers. I’m so grateful to be in an art community, in which, even in lean times, can exhibit generosity instead of competition. This Saturday night is Pop Noir, an auction to benefit Southern Exposure, an alternative art space that’s consistently invested in local artists, community engagement, and excellence in contemporary art. This female-led organization has always pushed the envelope, and I’m very proud to donate a pair of text-based drawings to support their work. Over a hundred and fifty other local artists have donated work too. Countless volunteers are contributing time. But it’s all for naught without buyers. So come on down—with auction prices starting at a fraction of the retail price, the price is right. Look for some really nice pieces by Weston Teruya, The Thing Quarterly by Allora and Callzadia, Michael Hall, Laurie Reid, Jeff Canham, Jamie Vasta, Edgar Arcenaux, Dustin Fosnot, and yours truly (pictured as follows). Pop Noir will be held at the gorgeous galleries at Electric Works at 8th and Mission Streets in San Francisco. Tix, more info, pics of the auction lots, and absentee bidding details here. Hope to see you there. Of course the other amazing alternative art space in San Francisco is Intersection for the Arts, who is well-respected for the rigor of their programming, and renown for making miracles on a shoestring. Like many non-profits, the downturn is hitting their typically lean infrastructure hard. Intersection’s auction comes up next weekend, on the following Saturday, June 13. Wednesday, June 10, the Headlands Center for the Arts holds their auction at the Herbst International Exhibition Hall in the Presidio. I’ve been an Affiliate Artist at the Headlands for a year and a half. The Headlands is an amazing locus for an international and local art community. When I think about relocating, few places compare with the quality of the Bay Area arts scene, partly because of the Headlands’ role in drawing international artists in residence to the area. So there you go. Support an artist directly, or support the organizations who support the artists. And take home some artwork!